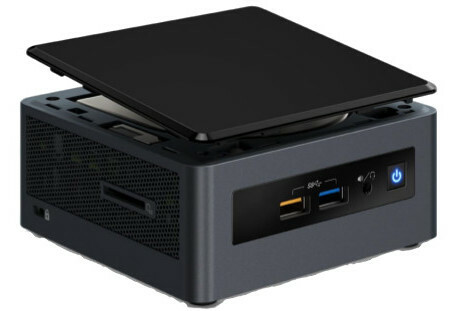 One of the first Intel NUC (next unit of computing) mini PCs to feature completely discrete GPUs (and not MCMs of CPUs and GPUs), the "Crimson Canyon" NUC8i3CYSM and NUC8i3CYSN, are up for pre-order. The former is priced at USD $529, while the latter goes for $574. The two combine Intel's 10 nm Core i3-8121U "Cannon Lake" SoC with AMD Radeon 540 discrete GPU. 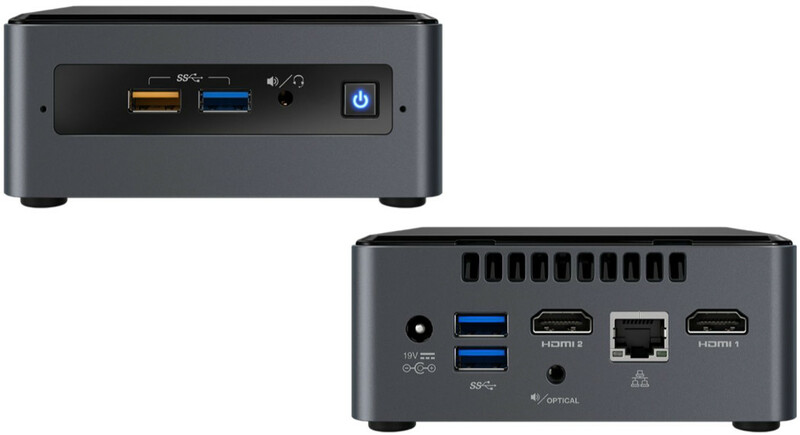 Unlike the "Hades Canyon" NUC, which features an MCM with a powerful AMD Radeon Vega M GPU die and a quad-core "Kaby Lake" CPU die; the "Crimson Canyon" features its processor and GPU on separate packages. The Radeon 540 packs 512 stream processors, 32 TMUs, and 16 ROPs; with 2 GB of GDDR5 memory. All that's differentiating the NUC8i3CYSM from the NUC8i3CYSN is memory. You get 4 GB of LPDDR4 memory with the former, and 8 GB of it with the latter. Both units come with a 2.5-inch 1 TB HDD pre-installed. You also get an M.2-2280 slot with PCIe 3.0 x4 wiring, and support for Optane caching. Intel Wireless-AC 9560 WLAN card handles wireless networking, while an i219-V handles wired. Connectivity includes four USB 3.0 type-A ports, one of which has high current; an SDXC card reader, CIR, two HDMI 2.0 outputs, and 7.1-channel HD audio. The NUC has certainly grown in size over the years. This one measures 117 mm x 112 mm x 52 mm (WxDxH). An external 90W power-brick adds to the bulk. Why is the MCM dead? They use that in the NUC8i7HVK. Not at all. This CPU is a gimped, barely-working low-end chip that Intel has squeezed out to convince stockholders to not freak out and sell off their stock due to the incessant 10nm delays. Heck, they even strong-armed several laptop OEMs into releasing SKUs using this same CPU+GPU setup just to be able to say that 10nm is "shipping for revenue". If you look into the details of the chip, you'll see that it's for some reason clocked lower than Intel's current 14nm i3s at the same wattage/TDP, and it has its iGPU entirely disabled (which really ought to open up that TDP for some higher clocks, no?). Those are some serious red flags. The pairing with the dGPU isn't for performance, it's an utter necessity to make a working computer out of this barely-working CPU. Semiaccurate has had some excellent commentary of the "launch" of this chip and the development of Intel's (broken) 10nm process. MCMs are an added expense compared to separate packages (due to manufacturing complexities, especially with EMIB-connected HBM2) which can be bought off-the-shelf, and thus (for now) reserved for high-end products. This makes sense. Sticking a Radeon 540M on an MCM would both make the package huge (it would need pinouts for all GDDR5 channels and the regular DDR4 interface, plus all the other, regular CPU and GPU pins), in fact it'd be a far larger package with more complex mounting than the KBL-G series. This would make zero sense for a low-end, low-volume product like this. This is in no way, shape or form a successor to the Skull Canyon and Hades Canyon high-end NUCs. Not even close. This is low-end even by NUC standards. Sure, the GPU is faster than Intel's UHD630 - but that doesn't take much. It's definitely not a gaming chip. The GDDR5 should make it faster than the iGPU in the Ryzen 5 2500U (and possibly also the 2700U), but that's about it. NUC's have been out for years in many variations, so when does a Next Unit of Computing become a Past Unit Of Computing? When they're discontinued. For now, I suppose they're edging in on "current unit of computing", though that'd be a stretch given their relative rarity.